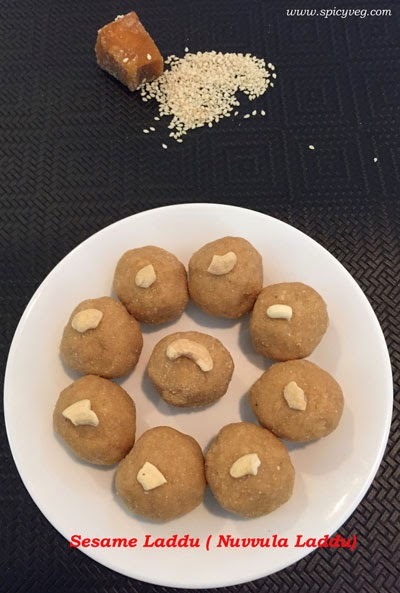 A quick and easy sesame seed laddu, South Indian dessert made for special occasions. Laddoo is the Indian word for any ball-shaped sweet. Laddoo is made with all sorts of ingredients like grains and legumes! This particular dessert is especially popular during winter months as sesame as thought to have heating properties. 1.Dry roast the sesame seeds in a flat pan on medium heat. Do this till they turn pale golden color and aromatic. 2. In a mixer add roasted sesame seeds and grind to a coarse powder. 3.Now add 1 cup of jaggery to the powder and grind well . 4.Take out the mixture in to a bowl and add 3tbsps ghee and cardamom powder .Mix well. 5.Grease your palms ,take enough mixture in your hand to form a golf ball-sized lump. 6.Roll between your palms till smooth. 7.Store for up to 10-15 days in an air-tight container.